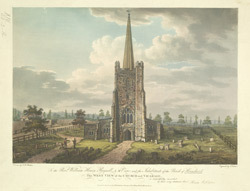 West view of St Andrew's Church at Hornchurch in Essex. This is a large parish church, considering that Hornchurch used to be a village before it became a London suburb. Most of the church was built in the Gothic Perpendicular style including the north and south aisles, chancel chapels, north porch and west tower. The large west tower has diagonal buttresses and a higher south west stair turret.